During 1944, Walter Baade categorized groups of stars within the Milky Way into stellar populations. 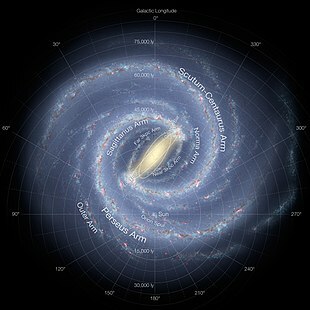 He noticed that bluer stars were strongly associated with the spiral arms and yellow stars dominated near the central galactic bulge and within globular star clusters. Two main divisions were defined as Population I and Population II, with another newer division called Population III added in 1978, which are often simply abbreviated as Pop I, II or III. Between the population types, significant differences were found with their individual observed stellar spectra. These were later shown to be very important, and were possibly related to star formation, observed kinematics, stellar age, and even galaxy evolution in both spiral or elliptical galaxies. These three simple population classes usefully divided stars by their chemical composition or metallicity,[a][b] whose small proportion of chemical abundance consists of heavier elements against the far more abundant hydrogen and helium. Many theoretical stellar models show that most high-mass Population III stars rapidly exhausted their fuel and likely exploded in extremely energetic pair-instability supernovae. Those explosions would have thoroughly dispersed their material, ejecting metals into the interstellar medium (ISM), to be incorporated into the later generations of stars. Their destruction suggests that no galactic high-mass Population III stars should be observable. However, some Population III stars might be seen in high-redshift galaxies whose light originated during the earlier history of the universe. None have been discovered, however, scientists have found evidence of an extremely small Ultra Metal-poor star (slightly smaller than our sun) found in a binary system of the spiral arms in our Milky Way. It was discovered while investigating the "wobble" of its larger neighboring star expecting to find a black hole. This star is very likely going to further our knowledge of Population III stars. Population II, or metal-poor, stars are those with relatively little metal. The idea of a relatively small amount must be kept in perspective as even metal-rich astronomical objects contain low percentages of any element other than hydrogen or helium; metals constitute only a tiny percentage of the overall chemical makeup of the universe, even 13.8 billion years after the Big Bang. However, metal-poor objects are even more ancient. These objects were formed during an earlier time of the universe. Intermediate Population I stars are common in the bulge near the centre of our galaxy, whereas Population II stars found in the galactic halo are older and thus more metal-poor. Globular clusters also contain high numbers of population II stars. It is thought that population II stars created all the other elements in the periodic table, except the more unstable ones. An interesting characteristic of Population II stars is that despite their lower overall metallicity, they often have a higher ratio of alpha elements (O, Si, Ne, etc.) relative to Fe as compared to Population I stars; current theory suggests this is the result of Type II supernovae being more important contributors to the interstellar medium at the time of their formation, whereas Type Ia supernova metal enrichment came later in the universe's evolution. Scientists have targeted these oldest stars in several different surveys, including the HK objective-prism survey of Timothy C. Beers et al. and the Hamburg-ESO survey of Norbert Christlieb et al., originally started for faint quasars. Thus far, they have uncovered and studied in detail about ten ultra metal poor (UMP) stars (such as Sneden's Star, Cayrel's Star, BD +17° 3248) and three of the oldest stars known to date: HE0107-5240, HE1327-2326 and HE 1523-0901. Caffau's star was identified as the most metal-poor star yet when it was found in 2012 using Sloan Digital Sky Survey data. However, in February 2014 the discovery of an even lower metallicity star was announced, SMSS J031300.36-670839.3 located with the aid of SkyMapper astronomical survey data. Less extreme in their metal deficiency, but nearer and brighter and hence longer known, are HD 122563 (a red giant) and HD 140283 (a subgiant). Population III stars are a hypothetical population of extremely massive and hot stars with virtually no metals, except possibly for intermixing ejecta from other nearby Population III supernovas. Their existence is inferred from physical cosmology, but they have not yet been observed directly. Indirect evidence for their existence has been found in a gravitationally lensed galaxy in a very distant part of the universe. Their existence may account for the fact that heavy elements – which could not have been created in the Big Bang – are observed in quasar emission spectra. They are also thought to be components of faint blue galaxies. 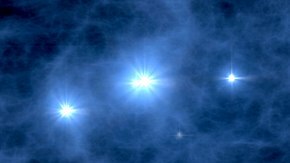 These stars likely triggered the universe's period of reionization, a major phase transition of gases leading to the opacity observed today. Observations of the galaxy UDFy-38135539 suggest it may have played a role in this reionization process. The European Southern Observatory discovered a bright pocket of early population stars in the very bright galaxy Cosmos Redshift 7 from the reionization period around 800 million years after the Big Bang. The rest of the galaxy has some later redder population II stars. Some theories hold that there were two generations of Population III stars. Current theory is divided on whether the first stars were very massive or not; theories proposed in 2009 and 2011 suggest the first star groups might have consisted of a massive star surrounded by several smaller stars. The smaller stars, if they remained in the birth cluster, would accumulate more gas and could not survive to the present day, but a 2017 study concluded that if a star of 0.8 solar masses or less was ejected from its birth cluster before it accumulated more mass, it could survive to the present day, possibly even in our Milky Way galaxy. One proposal, developed by computer models of star formation, is that with no heavy elements and a much warmer interstellar medium from the Big Bang, it was easy to form stars with much greater total mass than the stars commonly visible today. Typical masses for Population III stars are expected to be about several hundred solar masses, which is much larger than that of current stars. Analysis of data of extremely low-metallicity Population II stars such as HE0107-5240, which are thought to contain the metals produced by Population III stars, suggest that these metal-free stars had masses of 20 to 130 solar masses. On the other hand, analysis of globular clusters associated with elliptical galaxies suggests pair-instability supernovae, which are typically associated with very massive stars, were responsible for their metallic composition. This also explains why there have been no low-mass stars with zero metallicity observed, although models have been constructed for smaller Pop III stars. Clusters containing zero-metallicity red dwarfs or brown dwarfs (possibly created by pair-instability supernovae) have been proposed as dark matter candidates, but searches for these types of MACHOs through gravitational microlensing have produced negative results. Gibson, B.K. ; et al. (2013). "Review: Galactic Chemical Evolution" (PDF). Publications of the Astronomical Society of Australia. Retrieved 17 April 2018. Rudolf Kippenhahn (1993). 100 Billion Suns: The Birth, Life, and Death of the Stars. Princeton University Press. ISBN 978-0-691-08781-8. ^ Stellar metallicity is often defined using the ratio of total iron content of the star compared to hydrogen e.g. [Fe/H], which can be measured from many prominent absorption spectral lines found in most solar-like stars or red giant stars. The unit of measure often used for metallicity is the "dex", which is abbreviated from 'decimal exponent'. Stars with a higher metallicities than the Sun have positive logarithmic values, whereas those with a lower metallicities than the Sun have negative values. Hence, the measure of the Sun is 0.00 dex while Pop I or Type I Cepheid variable star Delta Cephei is +0.08 dex and Pop II or Type II Cepheid variable star W Virginis is about -1.0 dex. Young Population I stars have significantly higher iron-to-hydrogen ratios than older Population II stars. Primordial Population III stars are estimated to have metallicities of less than −6.0, that is, less than a millionth of the abundance of iron in the Sun. ^ Stellar metallicity can also be expressed in total metals as 'Z', being the fraction of mass of a star that is not hydrogen (X) or helium (Y). That is, X+Y+Z=1.00. The Sun has Z=0.0122 to 0.0134. However, Z values in stars are difficult to determine and are usually only rough estimates. ^ It has been proposed that recent supernovae SN 2006gy and SN 2007bi may have been pair-instability supernovae where such super-massive Population III stars exploded. It has been speculated that these stars could have formed relatively recently in dwarf galaxies containing primordial metal-free interstellar matter; past supernovae in these galaxies could have ejected their metal-rich contents at speeds high enough for them to escape the galaxy, keeping the metal content of the galaxy very low. Stuart Clark (February 2010). "Primordial giant: The star that time forgot". New Scientist. Retrieved 1 February 2015. ^ a b Shapley, Harlow (1977). Hodge, Paul (ed.). Galaxies (3 ed.). Harvard University Press. pp. 62–63. ISBN 978-0674340510. ^ Trager, S. C.; Faber, S. M.; Dressler, A. (2008). "The stellar population histories of early-type galaxies – III. The Coma cluster". Monthly Notices of the Royal Astronomical Society. 386 (2): 715–747. arXiv:0803.0464. Bibcode:2008MNRAS.386..715T. doi:10.1111/j.1365-2966.2008.13132.x. ^ a b c Gibson, B. K.; Fenner, Y.; Renda, A.; Kawata, D.; Hyun-chul, L. (2013). "Review: Galactic Chemical Evolution" (PDF). Publications of the Astronomical Society of Australia. CSIRO publishing. 20: 401–415. arXiv:astro-ph/0312255. Bibcode:2003PASA...20..401G. doi:10.1071/AS03052. Retrieved 17 April 2018. ^ D. Kunth & G. Östlin (2000). "The Most Metal-poor Galaxies". 10 (1). The Astronomy and Astrophysics Review. Retrieved 3 February 2015. ^ a b Lauren J. Bryant. "What Makes Stars Tick". Indiana University Research & Creative Activity. Retrieved September 7, 2005. ^ a b A. Heger; S. E. Woosley (2002). "The Nucleosynthetic Signature of Population III". Astrophysical Journal. 567 (1): 532–543. arXiv:astro-ph/0107037. Bibcode:2002ApJ...567..532H. doi:10.1086/338487. ^ a b Schlaufman, Kevin C.; Thompson, Ian B.; Casey, Andrew R. (2018). "An Ultra Metal-poor Star Near the Hydrogen-burning Limit". The Astrophysical Journal. 867 (2): 98. arXiv:1811.00549. Bibcode:2018ApJ...867...98S. doi:10.3847/1538-4357/aadd97. ^ Fryer, C. L.; Woosley, S. E.; Heger, A. (2001). "Pair-Instability Supernovae, Gravity Waves, and Gamma-Ray Transients". The Astrophysical Journal. 550: 372–382. arXiv:astro-ph/0007176. Bibcode:2001ApJ...550..372F. doi:10.1086/319719. ^ Heger, A.; Fryer, C. L.; Woosley, S. E.; Langer, N.; Hartmann, D. H. (2003). "How Massive Single Stars End Their Life". The Astrophysical Journal. 591: 288–300. arXiv:astro-ph/0212469. Bibcode:2003ApJ...591..288H. doi:10.1086/375341. ^ a b Salvaterra, R.; Ferrara, A.; Schneider, R. (2004). "Induced formation of primordial low-mass stars". New Astronomy. 10 (2): 113–120. arXiv:astro-ph/0304074. Bibcode:2004NewA...10..113S. doi:10.1016/j.newast.2004.06.003. ^ Soriano, M.S. ; Vauclair, S. (2009). "New seismic analysis of the exoplanet-host star Mu Arae". Astronomy and Astrophysics. 513: A49. arXiv:0903.5475. Bibcode:2010A&A...513A..49S. doi:10.1051/0004-6361/200911862. ^ Buchhave, L.A.; et al. (2012). "An abundance of small exoplanets around stars with a wide range of metallicities". Nature. 486 (7403): 375–377. Bibcode:2012Natur.486..375B. doi:10.1038/nature11121. PMID 22722196. ^ Tominga, N.; et al. (2007). "Supernova nucleosynthesis in population III 13-50 Msolar stars and abundance patterns of extremely metal-poor stars" (PDF). Astrophysical Journal. 660 (5): 516–540. arXiv:astro-ph/0701381. Bibcode:2007ApJ...660..516T. doi:10.1086/513063. ^ R. A. E. Fosbury; et al. (2003). "Massive star formation in a gravitationally lensed H II galaxy at z = 3.357" (PDF). Astrophysical Journal. 596 (1): 797–809. arXiv:astro-ph/0307162. Bibcode:2003ApJ...596..797F. doi:10.1086/378228. ^ "Best observational evidence of first-generation stars in the universe". ESO Astronomy magazine. 17 June 2015. ^ a b Sobral, David; Matthee, Jorryt; Darvish, Behnam; Schaerer, Daniel; Mobasher, Bahram; Röttgering, Huub J. A.; Santos, Sérgio; Hemmati, Shoubaneh (4 June 2015). "Evidence for Pop III-like stellar populations in the most luminous Lyman-α emitters at the epoch of re-ionisation: Spectroscopic confirmation". The Astrophysical Journal. 808 (2): 139. arXiv:1504.01734. Bibcode:2015ApJ...808..139S. doi:10.1088/0004-637x/808/2/139. ^ Bromm, V.; Yoshida, N.; Hernquist, L.; McKee, C.F. (2009). "The formation of the first stars and galaxies". Nature. 459 (7243): 49–54. arXiv:0905.0929. Bibcode:2009Natur.459...49B. doi:10.1038/nature07990. PMID 19424148. ^ Nola Redd (February 2011). "The Universe's First Stars Weren't Loners After All". Space.com. Retrieved 1 February 2015. ^ Andrea Thompson (January 2009). "How massive stars form: Simple solution found". Space.com. Retrieved 1 February 2015. ^ Carr, Bernard J. "Cosmology, Population III". ^ Dutta J, Sur S, Stacy A, Bagla JS (2017). "Can population III stars survive to the present day?". arXiv:1712.06912 [astro-ph.GA]. ^ Umeda, Hideyuki; Nomoto, Ken'Ichi (2003). "First-generation black-hole-forming supernovae and the metal abundance pattern of a very iron-poor star". Nature. 422 (6934): 871–873. arXiv:astro-ph/0301315. Bibcode:2003Natur.422..871U. doi:10.1038/nature01571. PMID 12712199. ^ Puzia, Thomas H.; Kissler‐Patig, Markus; Goudfrooij, Paul (2006). "Extremely α‐Enriched Globular Clusters in Early‐Type Galaxies: A Step toward the Dawn of Stellar Populations?". The Astrophysical Journal. 648: 383–388. arXiv:astro-ph/0605210. Bibcode:2006ApJ...648..383P. doi:10.1086/505679. ^ Siess, Lionel; Livio, Mario; Lattanzio, John (2002). "Structure, Evolution, and Nucleosynthesis of Primordial Stars". The Astrophysical Journal. 570: 329–343. arXiv:astro-ph/0201284. Bibcode:2002ApJ...570..329S. doi:10.1086/339733. ^ Gibson, Carl H.; Nieuwenhuizen, Theo M.; Schild, Rudolph E. (2012). "Why are so many primitive stars observed in the Galaxy halo?". arXiv:1206.0187 [physics.gen-ph]. ^ Kerins, E. J. (1997). "Zero-metallicity very low mass stars as halo dark matter". Astronomy and Astrophysics. 322: 709. arXiv:astro-ph/9610070. Bibcode:1997A&A...322..709K. ^ Sanchez-Salcedo, F. J. (1997). 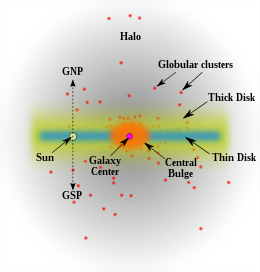 "On the stringent constraint on massive dark clusters in the galactic halo". Astrophysical Journal Letters. 487. L61. Bibcode:1997ApJ...487L..61S. doi:10.1086/310873. ^ Rydberg, C.-E.; Zackrisson, E.; Lundqvist, P.; Scott, P. (March 2013). "Detection of isolated Population III stars with the James Webb Space Telescope". Monthly Notices of the Royal Astronomical Society. 429 (4): 3658–3664. arXiv:1206.0007. Bibcode:2013MNRAS.429.3658R. doi:10.1093/mnras/sts653. ^ Overbye, Dennis (17 June 2015). "Astronomers report finding earliest stars that enriched the cosmos". New York Times. Retrieved 17 June 2015.